Katrina Davis (@katrinasivad) talks to the ladies about her deep hatred of sharing food, Columbo, and meeting Pibull. The ladies also talk about spring break, aqua pole dancing, and Tess has a surprising revelation. They answer a lady problem about how to stretch your workout clothes for multiple uses. Create your website with Squarespace! Head to www.squarespace.com and enter code LADY at checkout for 10% off of your first purchase of a website or domain. Get rid of old bad habits and work toward healthy goals with Noom. Go to www.Noom.com/LADY to get started with your free trial today. Start investing with Robinhood today! Sign up at LadytoLady.Robinhood.com to get a free stock to invest with. Order customizable high-quality furniture from Joybird. Go to www.Joybird.com/LADY for 25% off your first purchase today. 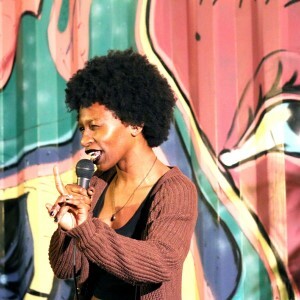 Katrina is a Baltimore-born, Florida-raised comedian with a sometimes dark, yet ultimately fun take on the world. Her comedy covers everything from family relationships and the pure joy of pizza, to death and conspiracy theories. She has been seen on America’s Got Talent and performs at shows all over Los Angeles. She was also named one of Time Out LA’s Comedians to Watch 2019. You can see her featured on the Seed & Spark comedy special Everything Is Fine.